We want to help you make the most of your initial appointment and provide more clarity on what to expect from a Naturopathic Consultation. When you are preparing for your first appointment please be sure to fill out our intake form, which you should have received with your confirmation email. The more detailed you are able to fill in the form, the more prepared the practitioner can be with any necessary materials during your appointment. If you have had any blood work or imaging done in the last 2 years, please send them in advance via email or bring them to your appointment. If you are having trouble accessing your medical records from your doctor let us know and we will reach out on your behalf. 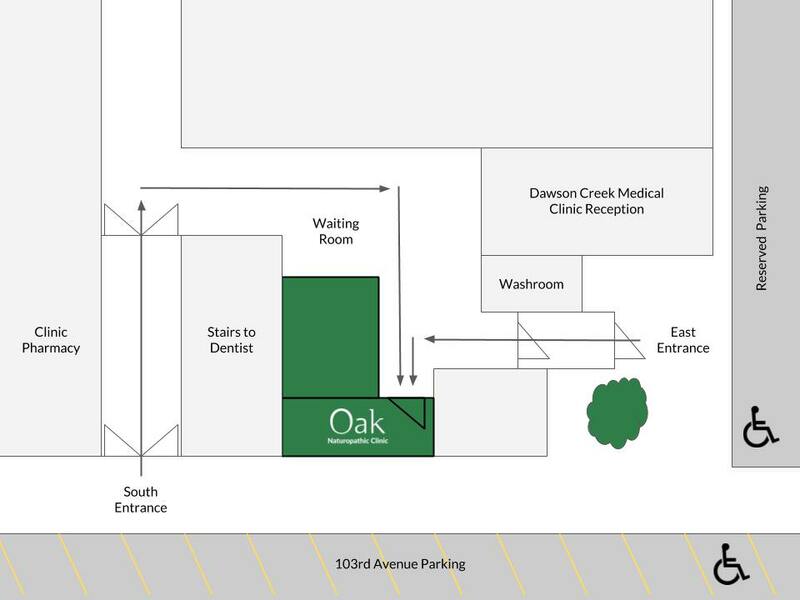 We are located in the Dawson Creek Medical Building and share the waiting room with the other practitioners. We currently have no receptionist, so when you arrive have a seat and Dr. Ayla Andrus ND will meet you in the waiting room (no need to check in). There is access to a washroom in the waiting area. Quickest access to the clinic is through the East door. Below we have given a floor plan. The practitioner will have gone over your intake form in advanced. The beginning of the appointment will be spent going through your answers, more in depth, and thoroughly discussing your primary concerns. We want to ensure we are directly addressing your concerns and getting to the root cause of what is happening. We will then go into a detailed health assessment (diet, exercise, sleep, energy levels, stress, mood, etc.) and a complaint oriented physical exam. At the end of your first appointment you will be provided with lifestyle and supplement prescriptions. At this point we may also send you for additional lab work or imaging. Payment: We accept cash, credit card and e-transfer. If you have extended health coverage, we are able to bill many major plans on your behalf. Your job after the first appointment is to do your best to follow the recommendations and to write down any difficulties you run into along the way. This allows us to easily identify and troubleshoot them at your next appointment. Our job after your appointment is to build an in depth health plan, comparing your information to scientific articles and research papers, then tailoring them to your needs, in preparation for your second appointment. Please let us know if you have any additional questions or reservations!